There are options to provide at least two levels of security to Tessera. Initially no security is enabled for Tessera. When you first start using Tessera there is a single password required to open the program. Tessera has initially been given a blank (no) password and is pre-set to open with the password automatically set to be blank. Consequently when you initially open Tessera you see no prompt for a password. It is recommended that you alter the password for the Tessera account to stop users from being able to open Tessera. To do this open Tessera preferences and go to General Preferences>Security Screen and use the Alter Opening Password. You’ll be prompted to enter the existing password (initially leave this field blank) followed by the new password you want to use. Once this has been altered you will be prompted every time you open Tessera to enter the new password and will not be able to access Tessera without doing so. If you lose access to the Tessera Opening Password then the only way to reset it is to download a new copy of Tessera from arawak.com.au and import your existing data. When you open the new file the password will have been reset to be blank. This means if someone can physically get hold of your Tessera data file there is a possibility that they could follow this procedure to open your data file. Which means they would have to physically obtain a copy of your file which could be difficult especially if the Tessera is hosted using FileMaker Server either locally or with FileMaker Cloud. Tessera also has a second level of security through the use of Tessera User Accounts. Tessera can be run without user accounts enabled but it’s recommended that you enable user accounts to at least have an Admin user. 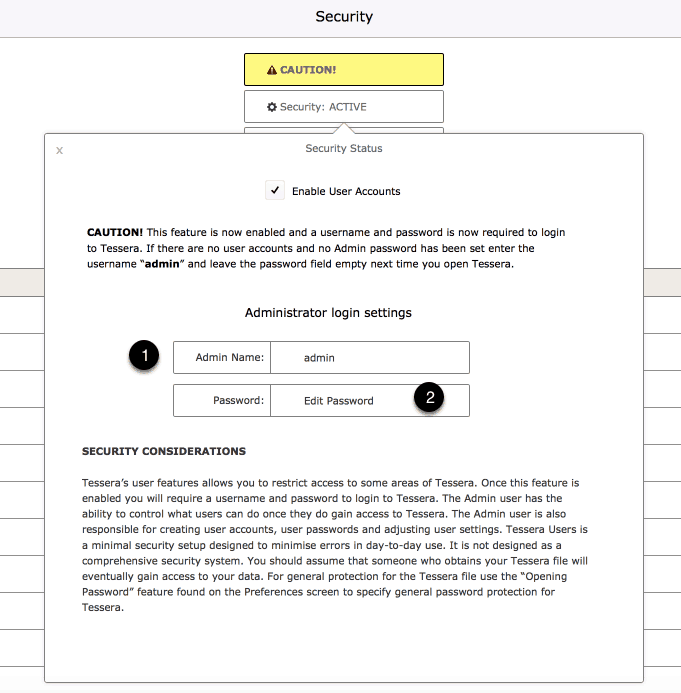 With User Accounts enables you can restrict users from certain areas and certain functions within Tessera. The Admin user is responsible for setting up user security accounts. User accounts have to be enabled to access any of these security features. It’s possible to enable Guest Access which would let guest users of Tessera to access any collections of artworks created using Tessera’s Collections feature that are marked as Pubic. The Admin user can add any number of users and specify different access privileges. Read the caution carefully. Once user accounts are enabled you can only access Tessera using a username and password. Use the Security button to access the admin Settings. Specify a Username and Password for each user. Select to deactivate this user temporally when required. Check the features you want to allow the user to access. 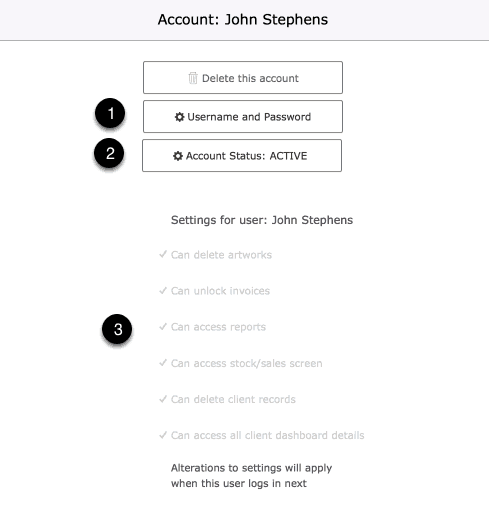 Changes to user account settings have no effect if the user is currently logged in. Any changes made to the user account only become active from the next time that user signs in. If your Admin password is lost: Download a new copy of Tessera and import your data. After an update Tessera user names security is disabled. Tessera user accounts is a simple system designed for a trusted group of employees to use Tessera with preventions in place to prevent errors. It is not designed as a robust security system. 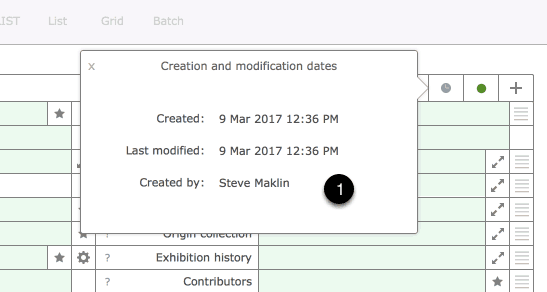 When in use Tessera stores the active user details when Artworks, clients and sales are created and can be viewed as shown here.